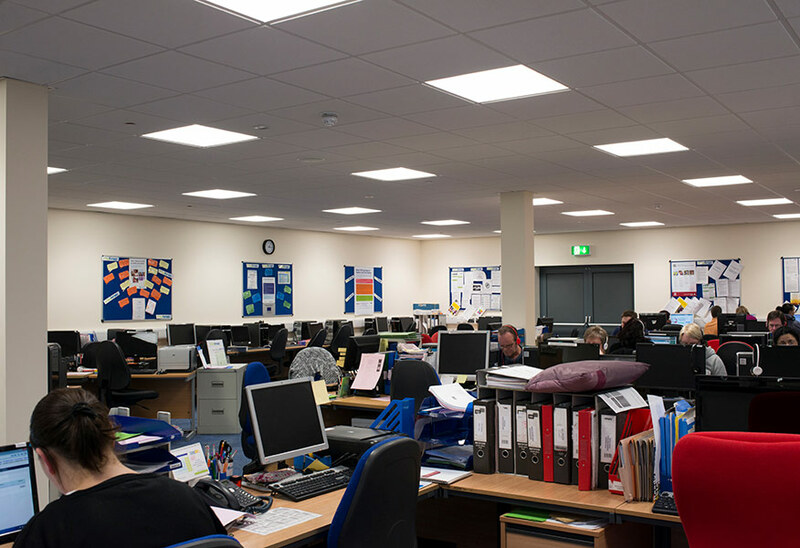 Tamlite Lighting, one of the UK’s leading manufacturers and designers of lighting, is launching a new range of LED lighting systems, which provide the outstanding light quality demanded by offices and schools, while also delivering savings on energy and maintenance costs. The comfortable, glare-free light required for schools and offices is now available from LED technology, with Tamlite’s new range of LED systems: SOLO, HORIZON and PRIMA. The ability to combine good light quality with low energy consumption and long lamp lifespans makes Tamlite’s LED range a compelling proposition for circulation areas, offices, classrooms, corridors and retail spaces, with options for recessed, suspended or surface mounting. Part of Tamlite’s 2020 portfolio of products for the projects and specification market, this range benefits from British design and manufacturing, and has been developed with the demanding requirements of designers, architects and installers in mind. All of the LED products feature a high Colour Rendering Index of >80, to ensure colours appear crisp and undistorted. There is a choice of either warm white (3000K) or neutral white (4000K) light hues, plus options within HORIZON for tuning the light hue, depending on the time of year. High-performance diffusers keep glare to a minimum and ensure the light remains uniform and comfortable enough for long periods of work. With options for dimming, daylight detection and presence control, as well as emergency lighting versions, Tamlite’s 2020 LED range provides the versatility needed by modern schools and workplaces. 2020 SOLO is an LED linear module with a diffuser or optic louvre, available for either suspended or ceiling mounting. Its discreet counterpart is the 2020 SOLO RECESSED, which is suitable for recessed mounting. Sleek and unobtrusive, the 2020 SOLO features high-quality aluminium extrusion and die-cast end caps and connection joints, with a choice of either grey or white finish colour. Continuous run versions are available for a seamless appearance. It also comes with the option of high frequency digital dimming control gear. Both the 2020 SOLO and the 2020 SOLO RECESSED are available in 45W versions and larger, brighter 55W versions. The 45W version achieves a light output of 3800lm at an efficacy of 84lm/W, with dimensions of 1183 x 65 x 65mm (1193 x 86 x 65mm for the recessed version). Its 54W big brother measures 1483 x 65 x 65mm (1493 x 86 x 65mm for the recessed version) and emits 4800lm of light at an efficacy of 87lm/W. As a guarantee of both light quality and high performance, the 2020 SOLO also bears Tamlite’s INFINITY mark of assurance, which identifies LED products that meet technical standards for excellence. Also bearing Tamlite INFINITY mark is the HORIZON, a recessed direct/indirect LED module, which achieves excellent light quality and superb performance. The 36W HORIZON produces 3000lm of light at an efficacy of 83lm/W, and it features a microprism optic that provides uniform light distribution. What’s more, the product’s option for tuning the colour temperature of the LED (from warm-white [3000K] to cool-daylight [6200K]) allows the light hue to be changed to complement the season. Measuring 595 x 595 x 70mm, the 2020 HORIZON has a powder-coated steel body, finished in white. It also comes with the option of high frequency digital dimming control gear. Designed and manufactured in the UK, the PRIMA is the result of true home-grown lighting excellence. This surface-mounted linear system is available with either LED modules or T5 lamps. It features a unique, high-performance diffuser optic for excellent glare control and light transmission. For complete peace of mind, the PRIMA also comes with a 5-year warranty as standard. With an attractive, curved profile, the PRIMA has a polycarbonate extruded diffuser with end caps and screw fixings, and a white powder-coated steel body. The product is available in two sizes: 1215 x 185 x 90mm, or the larger option of 1515 x 185 x 90mm. The LED version of the PRIMA can be specified at eight different brightness levels, ranging from the 20W, which produces 220lm of light output (at an efficacy of 110lm/W), to the ultra-bright 108W version, which produces 11560lm of light output (at an efficacy of 107lm/W). Light levels can also be specified with the T5 version of the PRIMA, which can be ordered with six different variants, ranging from a single 28W T5 lamp, up to the impressive brightness offered by two 49W T5 lamps. What’s more, the efficiency of the PRIMA doesn’t stop at the efficacy of the lamps and modules. The option of Tamlite’s VISION lighting controls allows for integral passive infrared (PIR) presence detection, with additional automatic dimming if daylight levels are sufficient to light the space. Tamlite’s 2020 portfolio of products represents an opportunity for offices and schools to achieve a high level of energy efficiency in lighting, without any compromise on light quality.